The Topps Opening Day line was never one of my favorites. Even as a kid, I deemed the brand inferior in pretty much all ways to the flagship Topps set. That said, 2001 was one of the rare years where I think I actually preferred the Opening Day set. 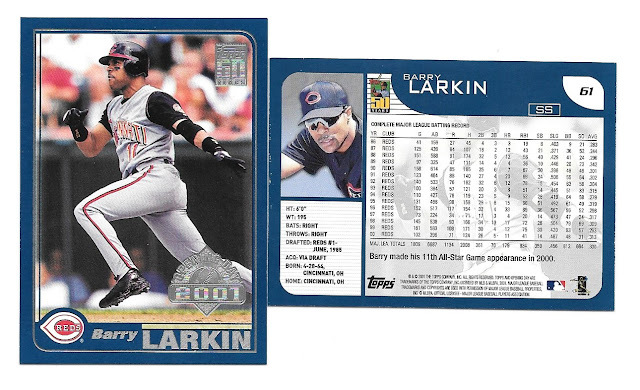 For the most part, Larkin's flagship card and Opening Day card are basically the same - the only real difference is the foil stamp for the brand in question. The reason that I prefer Opening Day in '01 is the border color. I definitely prefer the dark purple-blue to the sort of swampy green that the flagship set used. Yeah, good luck with that. Who did Topps think they were kidding? I imagine they wanted to simply be able to plaster "find autographs" on the retail boxes that they were marketing to kids. Of course, virtually no kid would ever actually find a signature with those odds... It's not hard to imagine that basically false proclamations like that ended up turning more people off to the hobby than it did turn people on to card collecting. Free LEGO Marvel Avengers Tower available! Delivery Time! More Prehistoric Cards! Trade Stack 95: Gold Medallion Edition! My Next Personal Box Break! Trade Stack 95: How About 1981 Donruss? !